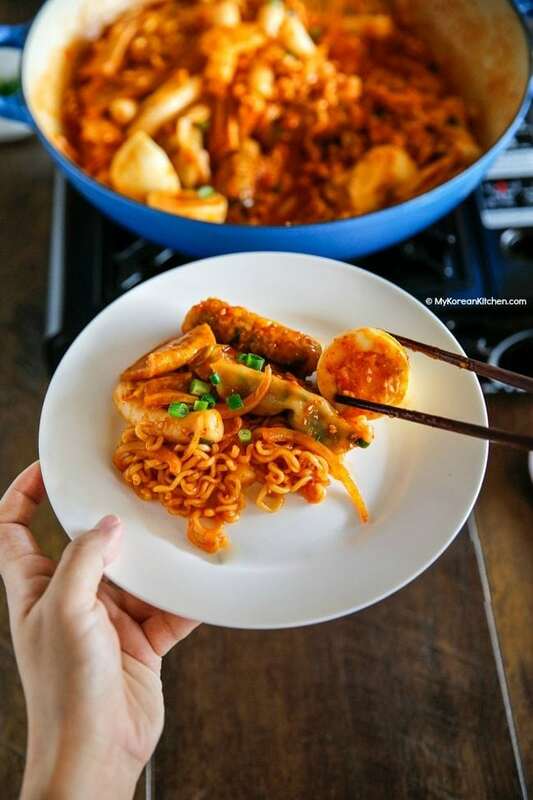 Spicy, super delicious and addictive Rabokki recipe! 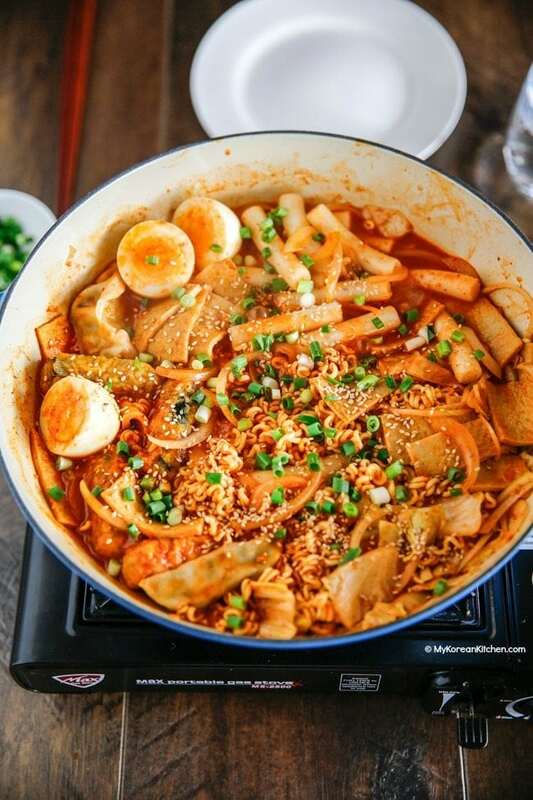 Today I want to share a popular Korean snack meal – Rabokki (라볶이). 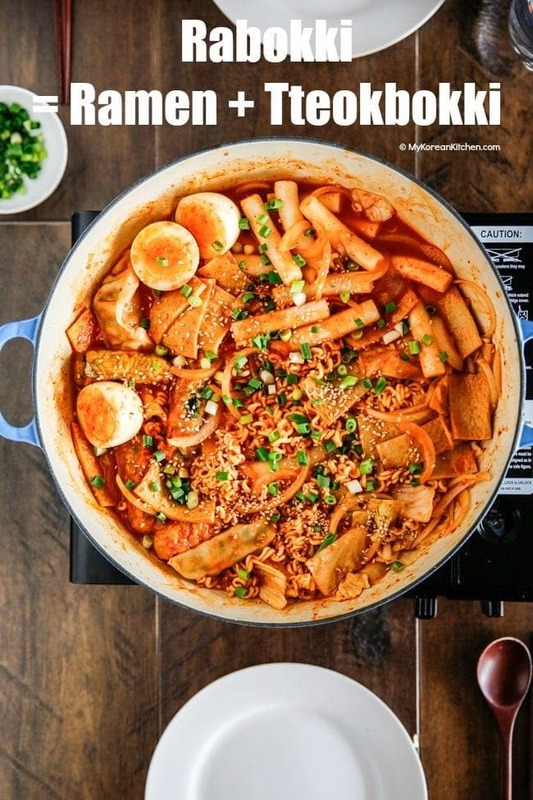 Rabokki is a combination of the words for Ramyeon (라면, instant ramen noodles) and Tteokbokki (떡볶이, Korean spicy rice cakes). I actually prefer Rabokki more than Tteokbokki as there’s more interesting and delicious additional ingredients in it. 🙂 How about you? 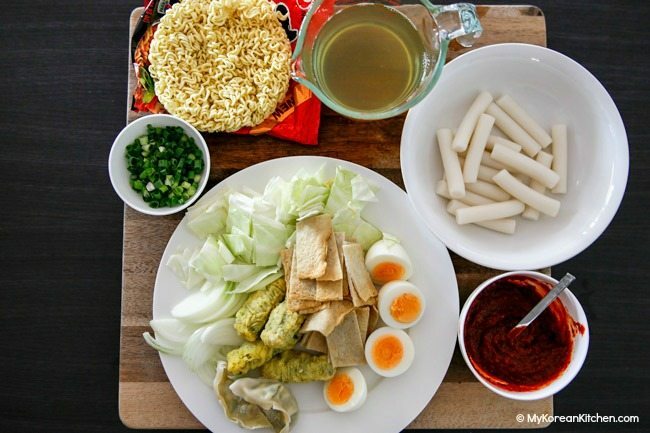 The standard ingredients that go into Rabokki are Korean rice cakes, ramen, Korean fish cakes, cabbage leaves, spicy sauce and hard boiled eggs (to top it up). Some people choose to add chewy noodles (jjolmyeon, 쫄면) instead of ramen noodles as well. Also some people add Korean ramen seasoning powder (which usually contains msg) in addition to the spicy sauce. (I know, right?!) Another ingredient you could add is sliced cheese. I forgot to add it this time, but I try to add it if I can. Anyway, try it soon! I hope you enjoy my recipe! Fresh Korean rice cakes 16 pieces (180g/6.3 ounces), separated, if you use pre-packaged or frozen rice cakes, separate them first then soak in warm water for 10 minutes before you use them. 4 deep fried seaweed spring rolls (100g/3.5 ounces) – I bought them from a Korean grocery store (freezer section) but you can make them if you have the time. 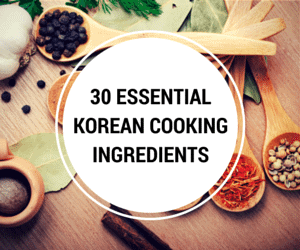 ** If you want to learn more about Korean cooking ingredients, check my 30 essential Korean cooking ingredients list! 3. 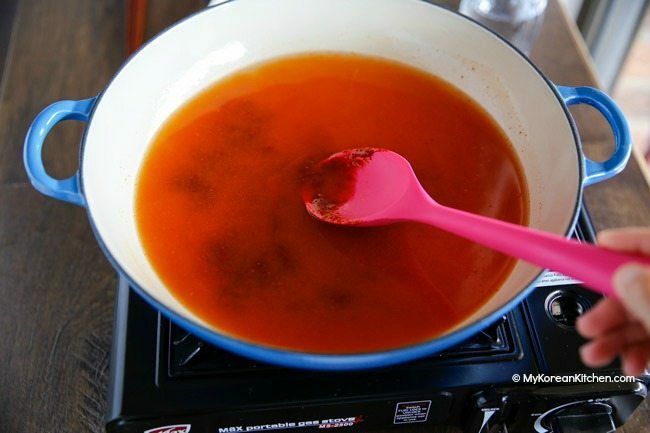 Once the broth starts to boil, reduce the heat to medium low. Add the rest of the ingredients and as they cook, stir around occasionally. 4. (If you’re cooking at the table) Add the garnish ingredients and start eating them as they get ready. Otherwise, serve when everything is cooked. Add the garnish ingredients just before serving. If you want to eat Rabokki more spicier, then adjust the sauce ratio by reducing gochujang (Korean chilli paste) and increasing gochugaru (Korean chili flakes). 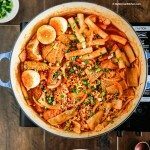 One Pot Ramen & Tteokbokki = Korean Rabokki recipe! 16 pieces Korean rice cakes (180 g / 6.3 ounces), separated, if you use pre-packaged rice cakes, separate them first then soak in warm water for 10 minutes before you use them. 4 deep fried seaweed spring rolls (100 g / 3.5 ounces), I bought them from a Korean grocery store (freezer section) but you can make them if you have the time. Once the broth starts to boil, reduce the heat to medium low. Add the rest of ingredients and as they cook, stir around occasionally. (If you're cooking at the table) Add the garnish ingredients and start eating them as they get ready. Otherwise, serve when everything is cooked. Add the garnish ingredients just before serving. Hi there – been loving your recipes! 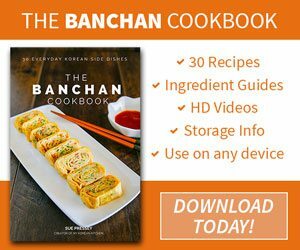 I am making this today – but it is unclear to me if I should add the “soup base” and “vegetable mix” packets that come with the Shin Ramyun pack to the recipe. Can you please clarify? Thank you! Hi Tanya, No, you don’t add those sauces. You’re only using the actual noodles from the noodle packet. Enjoy my recipe! I bought frozen rice cakes few months ago and didn’t have the time to do it until today. I got the rice cakes which was sitting in my freezer for quite a while now since I decided to make rabokki today. But then I saw the expiration date 2017.7.28 which means July 28, 2017. It’s already August 21, 2017 and it’s almost a month since it ‘expired’. I feel so bad. Can’t I use it anymore? Pls help me! Hoping for your reply asap. Thankyou so much! Next time I’m making twice the amount of sauce… It was delicious!!! Looks delicious, thank you for the inspiration! Copied, and will give it a try very soon! Oh my God this looks so good. I am so hungry now. I was in Korea last year and even at the airport they have really Korean food. Need to visit the Korean store to get the chili paste and other stuff. Thanks! I won’t stop you going shopping! 🙂 Enjoy! I’m new to your website, but am impressed. I live in NYC now so will be able to purchase ingredients. This Irish/English heritage 51 year old lived in Hawaii and Los Angeles for a few years, and happily first had Korean food in the 80s. It’s seriously delicious. My son grew up eating Korean food at least once every other month at a Korean restaurant in Augusta, GA we frequented. When he was six years old, he gave his order for spicy squid to a new waitress, who didn’t know us yet. The lovely Korean waitress responded, “No, no, little white boy, will be too spicy.” We allayed her fears, spicy squid was served to him and he was very happy! Yep. Had this many times in korea a long time ago. Yummy stuff! xiaojana, Glad you are so happy! 🙂 Yes, it was very sweet for me too. Will reduce some sugar next time. I am a huge fan of your web-site!!! Everything that I have cooked following your recipes have worked out beautifully. We have a Korean student staying with us at the moment and I followed your recipe for Rabokki. He was so happy with our dinner. He made a comment that it was exactly like the restaurants in Korea. Exactly!! Wow what a compliment!!! Thank you for sharing your wonderful recipes. Thanks Donna, I am very glad that it was such a hit in your house! Ohmigosh, I’ve been looking for this recipe everywhere. I have been craving it for 7 years and haven’t found it in the states! Thanks so much for posting it. I live in a small town with no Asian food stores nearby. Do you know of any store that sells the rice cakes (Garaeddeok) online? Oh I hope so!! If you know of any I’d be forever grateful! Otherwise do you have a recipe so I can make them myself? Thanks! Wow, I didn’t know I had a visitor from Bermuda. Very glad to hear that you enjoyed the dish so much!! Sorry to hear that fish cakes aren’t available there though. Hello, I am Jeong-Ah Lee and Korean. Glad to hear all of you have enjoyed Rabbokki though you people are not getting used to eating spicy food. 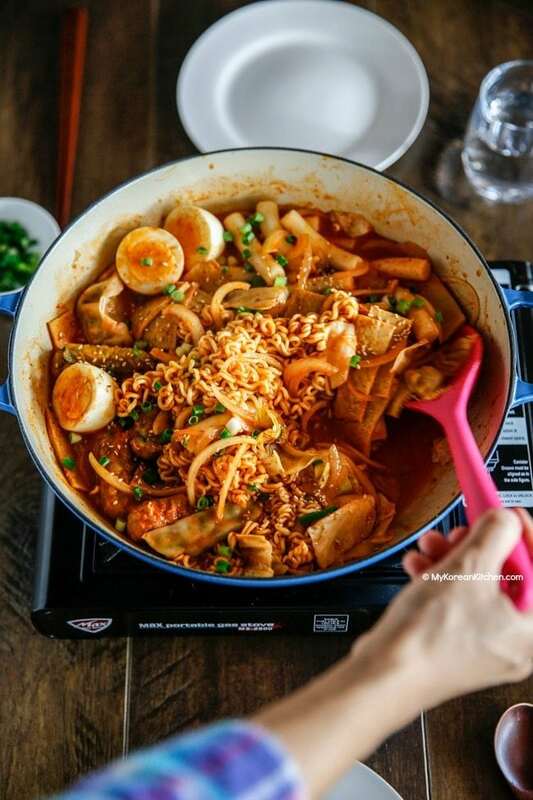 Depends on sauce, you can have Rabbokki with lesser spicy, salty or sweet..It’s up to individuals..Sometimes, I feel that Rabbokki being sold at street is too sweet and salty, but not spicy ^^. Those are not good for health. 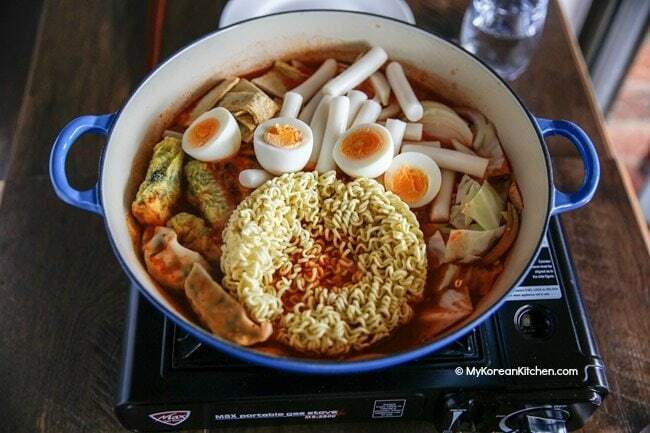 You can put several boiled eggs-of course after shell off-when you cook Rabbokki. You feel getting better to have the boiled egg yolk instead of drinking water when you feel really hot..
Hope everyone has wonderful time with your friends.. 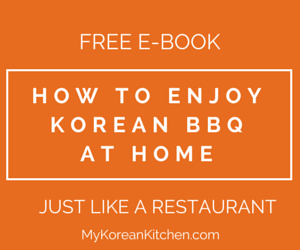 Thank you for this recipe – I will be sure to try it next week, after I go back to the Korean store, kukje. I actually bought it ready made and it was so delicious, so I will try to make it myself next week. I meant eomuk(어묵) or odeng (오뎅). Merci for your recipe! I’ll try to impress my gf next time 🙂 By the way, what Korean word do you mean by “fish cake”? That looks really appetizing! Great to hear that you guys loved it so much. loved this recipe! I was 2 tbsp of the “gold” teh yang gochujang and 2 tbsp of the “meh oon(spicy)” teh yang gochujang. i didn’t have any noodles on hand, so i didn’t add them. recipe was great though! just the right amount of sweetness and spice! here are two pictures of the dish i made! will be making again soon! my lovely roommates enjoying the meal! we also had curry and rice. . a BIG feast it was! I just try to cooking Rabokki with the recipe it was simply awesome! Thanks for the great recipe.. I simply like the dish, i tasted it a few times in the Korean Restaurant and always had a craving for this dish.. I cook it with the frozen rice cakes, but i think it turned out really well!It was amazing, all my friends love the rabokki..
ooh, I love rice cakes! But there’s only pre-packaged frozen ones available at where I live. I’m sure the fresh ones taste much better?! That must be why I have some pimples too…sigh.